Hector and Cedric were commissioned to construct a Pergola as the finishing touch to a newly completed landscaping job on a listed building in Great Hucklow, the Peak District. The Pergola was made from sustainable Douglas fir sourced from Wales. We traditionally jointed the frames together with oak pegged mortice and tenon joints. The frames were held together with slightly curved cross pieces, to create a unique timber framed structure. 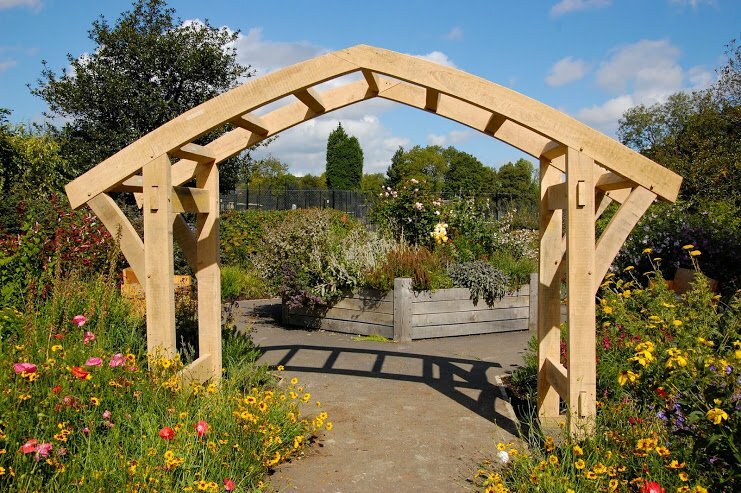 This Pergola could be adapted to have a canopy fitted, or a trellis added or turned into a unique garden building with walls and potentially a living green roof added. We have experience of crafting a variety of different Pergola’s to suit our individual customer’s needs. We have even made a Pergola combined with a car port for one of our customers.